Former vice president and a member of the Presidency of the Croatian Community of Herceg-Bosna, and later Croatian Republic of Herceg-Bosna, and at one time the president of the Croatian Democratic Union of Bosnia and Herzegovina (HDZBiH), Dario Kordic, landed at Zagreb, Croatia, airport after serving 16.6 years of the 25-year prison sentence imposed by the International Criminal Tribunal for the former Yugoslavia (ICTY) for 1993 war crimes committed in Central Bosnia, Lasva Valley, against Muslim civilians. Several hundred people gathered at the airport to welcome back home from prison the man they consider a hero, not a war criminal. Kordic’s ICTY sentence was not the one of a war criminal who committed crimes but that of a politician who was at the time of those crimes in a high position of Herceg-Bosna political leadership and responsibilities. Indeed, among the welcoming crowds were many most esteemed historians, public personalities who work tirelessly at justice for victims as well as some highly positioned political officials at the time of the 1990’s war. These include: dr Zvonimir Separovic, dr Slobodan Lang, dr Josip Pecaric, dr Zdravko Tomac, dr Ivic Pasalic, dr Ante Kovacevic, dr Josip Jurcevic – Bishop Vlado Kosic from Sisak was there to lead a prayer. 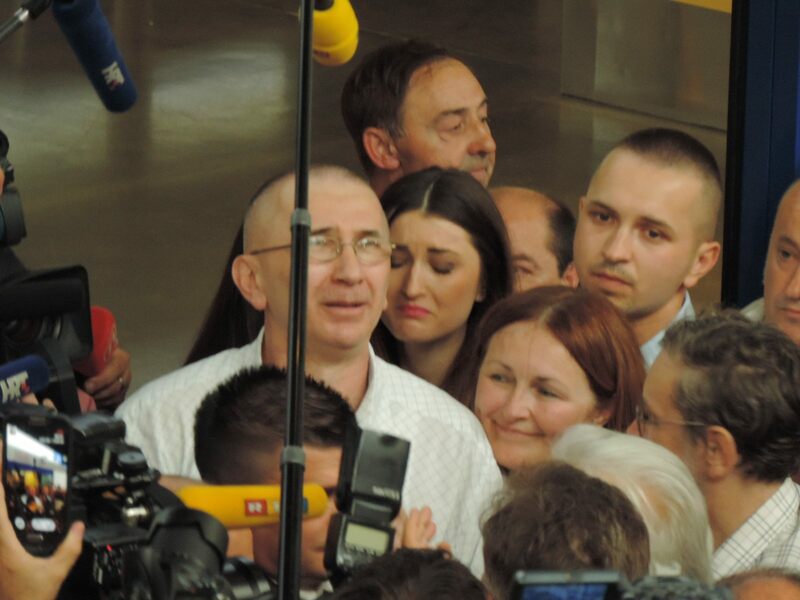 After tearfully embracing his wife and children, Kordic turned to the masses at the Zagreb airport with an emotional speech in which he thanked God, the Catholic faith and the whole of the Croatian nation. Kordic is one member of the group of Bosnian Croats from central Bosnia, who voluntarily surrendered to the ICTY in The Hague in 1997 after U.S. authorities and the World Bank put Croatia’s Franjo Tudjman and his government under mounting economic pressure to have Kordic and other Bosnian Croats arrested. Kordic said that he gladly welcomed the opportunity to clear his name. Kordic was sentenced for war crimes committed in Ahmici against Bosnian Muslims, for the perpetration of which he actually is not responsible. And, it’s necessary to point out here that on the same day the Ahmici crimes occurred, crimes perpetrated by the Muslims/ BH Army against Croats occurred in the village of Trusine where the entire Croatian village population was murdered and no one to this day has been made accountable for this, just as no one has been made accountable for similar war crimes in Doljani, Grabovica, Uzdol, Jurici, Bugojno … where, even today, the Croats are constantly threatened with death. After the war ended in 1995 and the signing of the Dayton Agreement for Bosnia and Herzegovina the failed Bosniak scenario to create an ethnically pure Muslim/Bosniak region within Bosnia and Herzegovina moved into the corridors of the ICTY. Bosnian Croats Dario Kordic and Tihomir Blaskic found themselves in the Hague where the prosecution’s politically charged and unfounded plan was to show that Croatia’s president Franjo Tudjman started ethnic cleansing against Muslims in Lasva Valley in order to create a Greater Croatia. Dario Kordic’s case was allocated to the British prosecutor Geoffrey Nice and the judge was Judge Richard May, also British; the witnesses for the prosecution were officers of a British battalion, whose testimonies omitted to address all BH Army (Muslim) offensive operations, all their crimes against Croats, and especially all the horrific crimes of the Mujahedeen units of the BH Army. Looking down upon history we find that the British forces were instrumental in turning the hundreds of thousands of Croat refugees in May of 1945, in Bleiburg, Austria, back to communist Yugoslavia, knowing they would be massacred. The fact that these people sought the promised refuge/asylum in the West at the time made no difference. And in the ICTY case against Kordic the British again play an important role! One wonders why Britain, post- New York “9/11” terrorist attack, joins the war against terror when at about the same time the Kordic case was at the Hague, here in the corridors of ICTY members of it’s judicial echelons saw to the protection of Bosnian Muslims and their Mujahedeen terrorist units. One cannot change the ICTY’s judgment against Dario Kordic. He had pleaded innocent to the charges of war crimes and lost. He has served his time in prison and paid the dues to society imposed upon him by the court even if those dues are seen as having been based on highly questionable foundations. But one can change one thing in relation to Dario Kordic’s war crimes conviction: one can lobby the government corridors and insist on investigations into the ICTY judgment in order to demonstrate upon which falsification and political maneuvering it did arise! This is particularly important given that the “Herceg-Bosna 6 Croats” (Jadranko Prlic, Milivoj Petkovic, Bruno Stojic, Slobodan Praljak, Berislav Pusic, Valentin Coric) convicted in 2013 by the ICTY Trial Chamber for similar crimes and similar political constructs in 2013 still await Appeal. 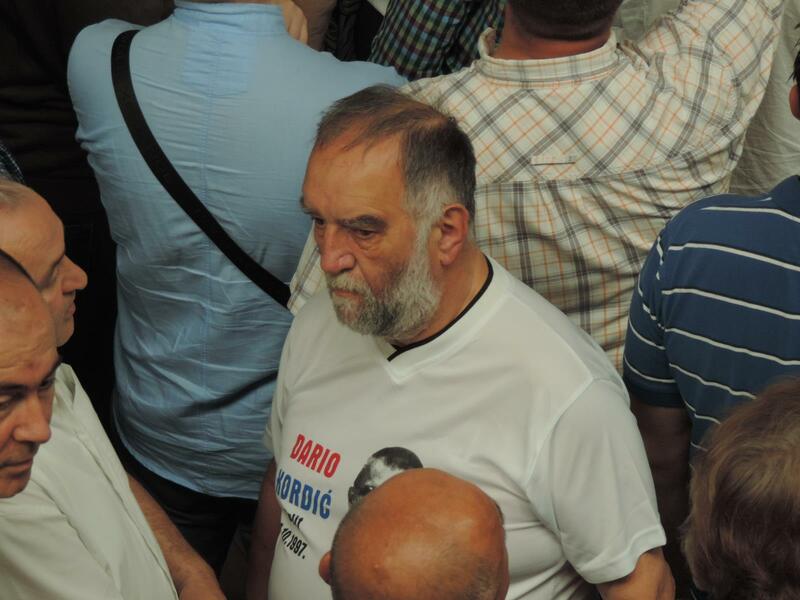 One truth is among us: Dario Kordic has returned home on conditional release from prison for war crimes after serving two-thirds of his prison sentence. The other truth is yet to arrive: What political games saw him behind bars while the Bosnian Muslims/Bosniaks involved in a similar role as Kordic – political responsibility – are walking the streets freely! 100 Muslim civilians were killed in the village of Ahmici i April of 1993 by Croat Bosnian forces, Clare. Alija, I do my homework quite well – when it comes to Ahmici some would be historiography reporters say in Ahmici 100 were killed, some say 117, some say 120…but even 1 is too many. Perhaps I should have given the numbers of Croats killed by Muslims at the same time as Ahmici occurred,instead of simply putting the link to documentary “In Broad Daylight” but this article is about Ahmici. It’s all so horrible. Ethnic cleansing, genocide, religious oppression – who’s right, who’s wrong? All depends on your ethnicity and religion. Toss in meddling nations with their own agenda – no one stands a chance. Thank you again for your tireless efforts. My knowledge of this conflict was negligible before discovering your insightful posts. Much appreciate your feedback on this difficult but compulsory topic, Notes To Ponder. I could not DIS agree more with that. An investigation needs to take place to find out how an innocent man was sent up the river for 17 years. The history books will write that this man was a killer. Anyone incarcerated for a crime they did not commit wants to see their name cleared. Your comments are an oversimplification of events… The 1990s former Yugoslav wars were clear. An aggressor, the Yugoslav National Army, backed by the Serb regime, Serb insurgents, many calling themselves Chetniks after the Ww 2 killers who slaughtered Croats and Muslims… First attacked Slovenia and then Croatia because the peoples in these lands voted for independence in free and democratic elections. The Serbs and their backers, Communists of every stripe, decided to keep Yugoslavia as a whole through force. They occupied 1/3 of Croatia and cut off the south from the north. Interesting that most western nations recognized the independence of these 2 nations immediately. This was followed by Bosnia seeking independence as well. Well the Serbs would have none of that and then moved to partition Bosnia. 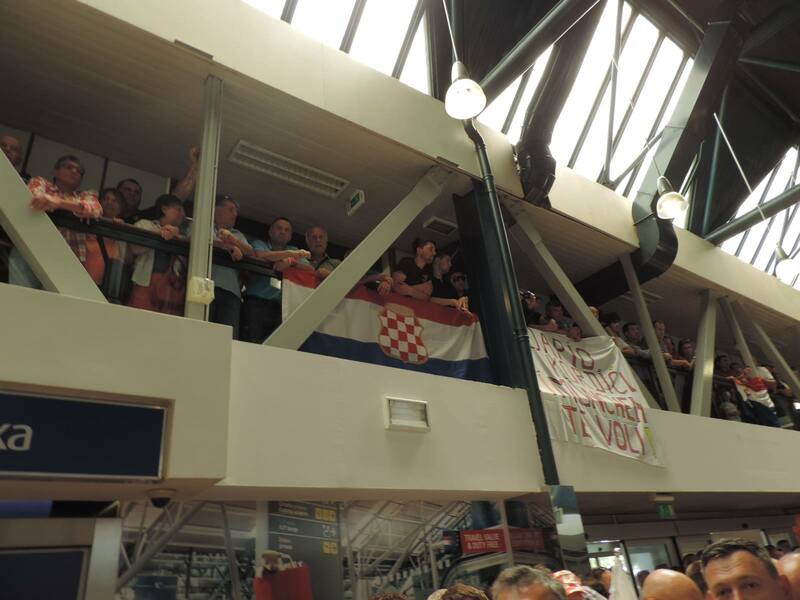 Sadly the Bosniak naive and left leaning government under Izetbegovic greeted the Serb army with flowers and cheered as Croatia was decimated. 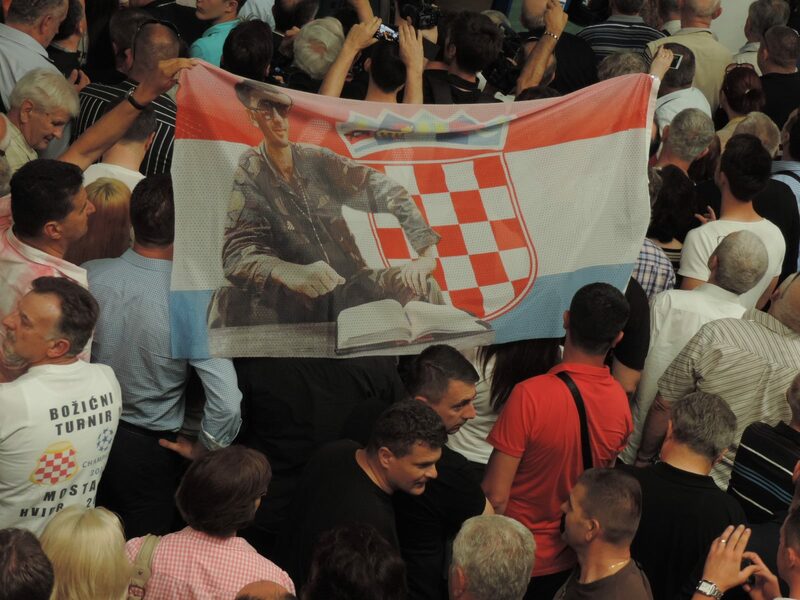 Only the Croats in BiH fought back which is why they formed the army the HVO. Finally the dumb government of Sarajevo created a TO and then the ABih when they saw they too were being slaughtered by Serbs. Sadly this regime also let in Mujahedin fighters from the east who helped them push for an Islamic state or a 3rd mini Yugoslavia. When the Bosniak regime realized it was easier to fight the Croats than the Serbs, they did. See my note below on the excellent researched book Dossier. I also encourage you to read Schraders excellent book The Muslim-Croat Civil war in central Bosnia. After Bosnia was partitioned by Western leaders through the Dayton Accords, which effectively gave the Serbs half the country with the Bosniaks and Croats getting the othe half, the Serbs went after Kosovo. Note a war was never fought on Serbia proper or it’s ally Montenegro. This speaks volumes of their continued desire to create a Greater Serbia on territory which was never theirs. To this day they “own” the province of Vojvodina which was annexed by force in the 1980s. One Final note, Croats and Bosniaks joined forces to push back the Serbs annexed territory in mid 1990s military operations referred to as Storm, Mastrael etc. They were incredibly successful and proved the two victims of Serb terror could fight back formidably. Military colleges would be studying these operations now if it were US soldiers. Sadly the west meddled and threatened Croatia with sanctions. If the Croats and Bosniaks were not forced to sign Dayton you would not have a divided Bosnia today, the Serbs would have been defeated and peace would exist. Not responsible? Whose history did you study? Kordic was responsible for more than just killing more than 80 Muslim men and children in Ahmici in course of one morning! How can you justify his order to kill children, a baby who didn’t even get a chance to turn one year?? And you call him a hero? What kind of a world are we living in since we acknowledge war criminals as heroes? Get your facts straight before writing a piece like this! Oh dear, history.la – yes you must be a historian who has no clue about the difference between actually committing murder and being charged with it on grounds of political responsibility. The facts in this article are all there, albeit in brief, but they are there. If people see Kordic as their hero that is their right and by what I see many historians and internationally renowned personalities have put their name at the head of that lot and, that being the case, we certainly need to take note and dig deeper into the background of how that justice against Kordic was delivered in the Hague. And don’t forget, that was at the time when international drums of political lies against Croats (generals Gotovina, Markac…) sounded loudly under Carla del Ponte’s mandate as ICTY chief prosecutor, which of course was blown out of the water… No, history.le, Kordic did not commit those murders – he served his prison sentence as he was found guilty on the basis of what ICTY said was his political responsibility. The actual individuals who had committed those murders are to be held guilty and responsible for them. Political responsibility has been proven to be a thing that can easily be concocted if those concocting have a heavy enough clout in international political arena. So, History Professor of Denmark – how come you did not mention the facts in the “In Broad Daylight” documentary of murders, massacres committed by Muslims against Croats or the ones mentioned in the body of the article? How come you did not comment on the fact that no one has been held responsible for those yet? To me the article written by Ina is filled with facts … it looks your history professorship might be lacking in many things, but then again you may not be a professor after all … just a person hiding behind historiography as if it was history, which of course it often IS not. There is much out there that is not covered due to politics and a hard left leaning, pro Yugoslav press corps. I know bc I used to work in the media. 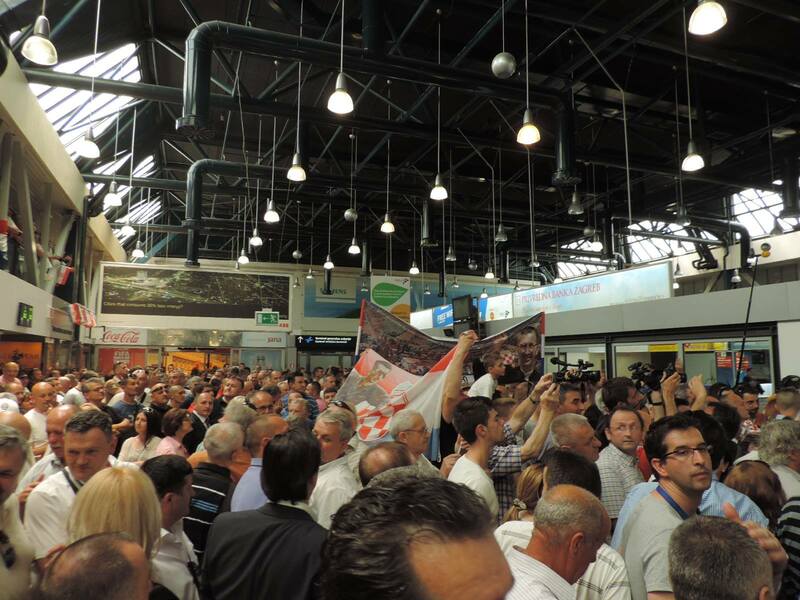 There are dozens of “Ahmicis” that took place against Croats in BiH… Krizancevo Selo, Buhine kuce, Maljine, Dusina, Visoko, Grabovica, Uskoplje.. I could on. And no one, I repeat, no one has be charged with these crimes. Please educate yourself before spewing ignorant statements. You are very ignorant and need to read more than Borba or Oslobodjenje. Crimes committed by any party should be properly investigated and individuals tried correctly. One man cannot be made a political scapegoat. Sadly the ICTYs position is to equalize blame among a Serb aggressor and a Croat, while a Bosniak is always perceived as the victim. I know, I used to work there. Furthermore, if the ICTY was concerned with justice, the men responsible for the heinous massacre of Croats at Ovcara near Vukovar for example, would have been tried in Den Haag, not in Belgrade, Serbia. The individual who has the greatest depth of knowledge on the cases in the Hague is author Visnja Staresina. I encourage anyone who reads Croatian to read her work. Excellent commentary and facts that I am sure many people do not know. 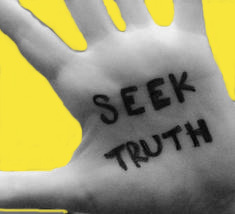 Let’s keep digging for the truth, let’s make sure true justice prevails. Facts will always win over opinion, lies and propaganda, we just need to make sure the truth is revealed. Staresina recently made an interesting statement in an article published in narod.hr,. Her main point was that it is not only in Croatia’s interest but also in European interest, to reinforce security within the country and The Union, to investigate the validity of the ICTY verdict. A LOT of political influence meddled in the process of the court, which needs to be subtracted from the trial itself in order to get to the truth and set the record straight. Even those who lost loved ones in he Ahmici massacre should be pressing for this, they should not be satisfied with Carla’s disregard for justice just to save her own arse, much like her effort in the Gotovina trial. Incidentally, neither Ahmici nor Grubori are characteristic of a professional, disciplined army that freed Croatia and forced the Bosnian serbs into submission and eventually led to Dayton, however flawed of an agreement it ended up being. No, these massacres have the clear m.o. of KOS, just like with their other operations like the bombing of the Croatian legislature, and operations Opera and Labrador. It’s so difficult to know why things some were judged and found guilty and others were not. That part about the British, supporting one faction, but gunning against a similar faction is such a contradiction…I don’t get it. There must have been ulterior motives behind it all. I think it’s time for more transparency. They talk about transparency a lot…but where it’s really needed. That’s a different story. A British prosecutor, judge and witnesses found Croats guilty while not even giving one damn about Muslim crimes against Croats? Oh, how shocking. Although we cannot bring back lost years, we need to use moments like this to remind ourselves why we have to fight against lies, propaganda and political games, even when it seems utterly futile. We cannot ever become apathetic against forces that seek to harm and deny Croatia’s right to exist, or rewrite our history. Justice really means little if we’ll only implement selective, politically motivated “justice”. It’s an insult to victims and a very, dangerous slippery slope. The fact that much was left out in testimonies for the prosecution is scary, Kat, to say the least. 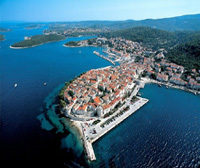 The British have never been freinds to Croats. Every case where someone has been wrongly incarcerated has the filth of British on it somewhere. Someday all of us will realize this. I am just happy one more Croat is free and we will right the wrongs of the past someday. Some like you I guess,the number was,is 116. Supporting notions of Political responsibility (especially where conditions exist for defense to be mounted, for self-preservation as the highest of human rights) and, therefore, Collective Guilt and Collective Punishment negates the full and deserved possibility of treating individuals as individuals. The fact remains that a person must have actually committed a crime in order to be guilty of it. This fact appears as an inconvenient truth, a sticking point, an irritant – like a lump in the throat, or a speck in the eye, that simply will not go away for those on the merry-go-round who seek to convict a whole nation, an ethnic group… Having made their choice, the ICTY prosecution had ignored the truth that individuals must individually commit acts to be held individually accountable for them. It becomes irrelevant; revenge or political tracks seem higher on their list of priorities – the question is: in whose name? Individual responsibility has ceased to matter for them, even in cases where that individual responsibility clearly shows that the individual in question acted in breach of orders or in breach of policy. Those who remind them (ICTY prosecution) of it are attacked by someone or other, which attacks include shaming tactics, and eventually, the fact itself is attacked – the responsibility of the one who actually committed the crime gets pushed into oblivion as we are led to accept that individual responsibility is the product of false consciousness; all men carry guilt. What sadness the humanity has reached. Thank you, onawingandaprayer, indeed the great sadness for humanity. Chasing the political responsibility for war crimes, where there is no overarching foundation for it but a product of someones mind, is what leads to the actual perpetrators of crimes to walk freely while the “world” plays politics. …apparently in shortly before the “Ahmici” massacre, there was car load of “soldiers” with British accents passing through Dubrovnik! If true, these were probably British MI6 agents who could have been stirring trouble between the Croats and Muslems during the time of the Bosnian crisis! 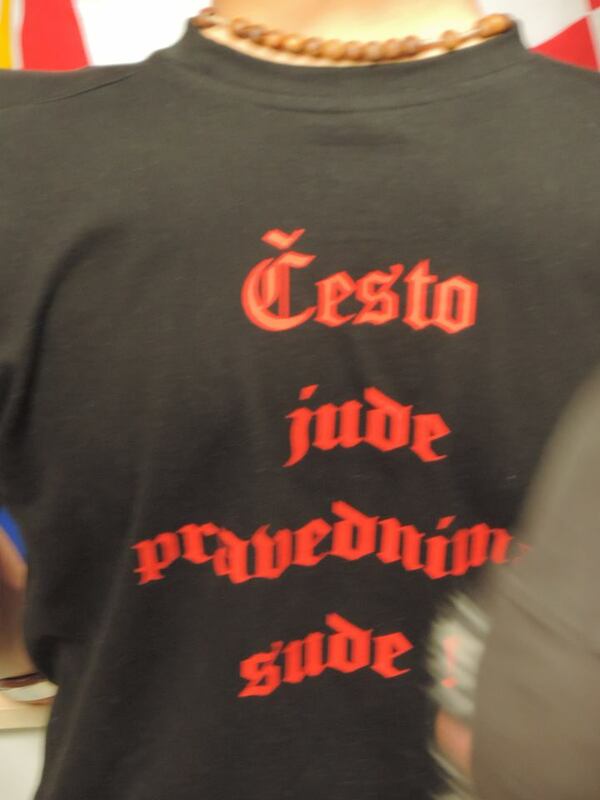 The Croats and Bosnians were never enemies, as their enemy were the Serbian chetniks! Napolean Bonaparte described England as “perfidious Albion”! Oh yes, Tempus Fugit, foreigners in all shapes and sizes cam to “dish out” a life they thought people of Bosnia & Croatia should have after the fall of Yugoslavia. Photos of British troops all over Ahmici minutes after it happened also exist. Well, I do’t need to read this article at all. It is enough to see the pictures and iconography and it is very clear what is your point. Dario Kordic innocent? You must be kidding. It is sad that war criminals like him get only 25 years and walk free after 15. By the way Catolic church is directly involved in his crimes. Believe me I was there. Unfortunately, I fought for HVO and I am ashamed for that ( didn’t have choice). Perhaps, you should be the one behind bars, Miroslav. Miroslav you writer sheer nonsense. “Catholic Church is directly involved in his crimes.” Such stupidity. Really Sherlock, let’s see the evidence. I don’t believe you were there or that you were in the HVO or anything you write. Sheer nonsense. 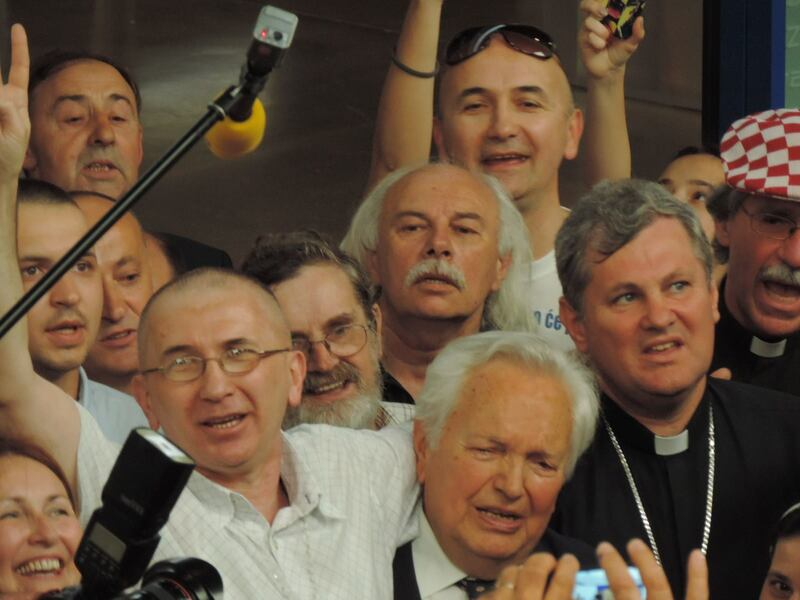 By the way because of him, only him and YOUR president Tudjman, Half of Bosnian Catolics are out of his homes. Because of them ,many many, of my closest friends are killed. And you want proof of something. Remember, you can deny the truth but you cannot hyde it. Maybe you can hyde it from yourself eventhoug people are bad there are not stupid. Miroslav, you can thank your beloved Milosevic and Tito before him for all ethnic cleansing in the last 70 years in the region. As you obviously do not know, President Tudjman actually offered a loose confederacy with all the other republics before Croatia, in a free and democratic election, decided to break-away. You still haven’t shown evidence of some Catholic conspiracy regarding the war. 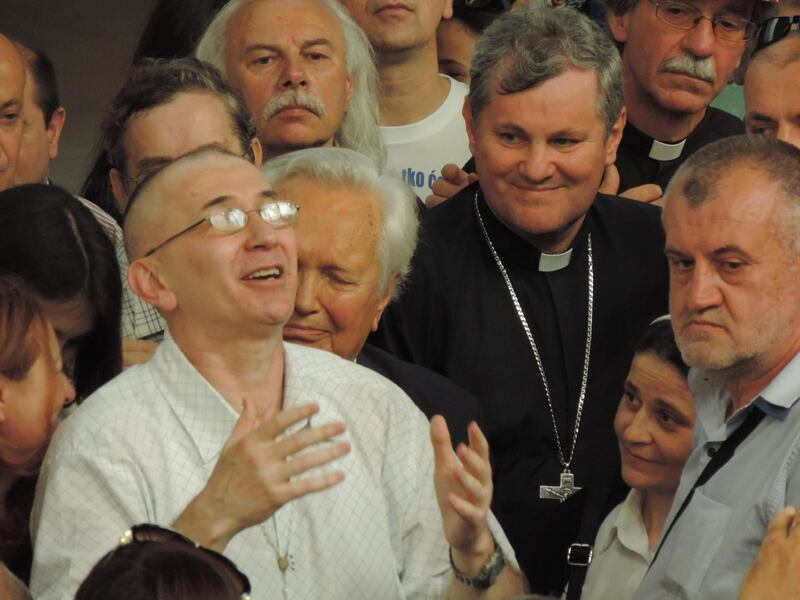 I’ve been to BiH since 1992 and know what the situation for Croatian Catholics in BiH is very well. 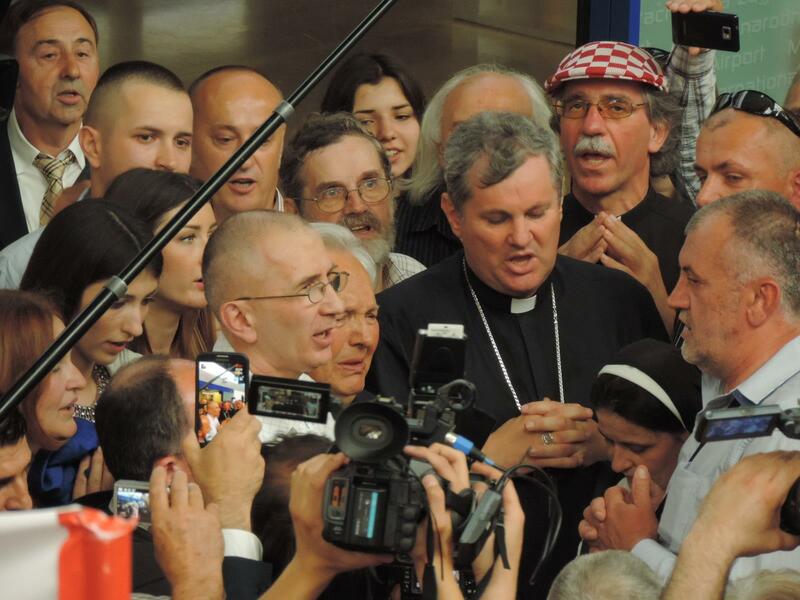 In fact, I visited Bishop Komarica in Banja Luka and Cardinal Puljic in Sarajevo. I have been everywhere from Vitez to Mostar, Orasje to Olovo to Zenica. Your blathering makes no sense and has nothing to do with Dario Kordic. Read more fact based material and not Borba, Oslobodjenje and other such garbage. Piece of advice Miro…use spell check too before you post. Hurray Dario visits his hometown of Busovaca! Hurray! Did not know about him or the events that happened. It is all very saddening. It is very sad, psychologistmimi, and real. It is very difficult to deal with and while the victims deserve justice one cannot but question with criticism the process of prosecution that leans towards political guilt more than it does towards the actual perpetrators of crimes (who often stray away from the political guidelines and then act alone) and the elements of circumstances where threats to life, violence and aggression create the need to defend self=preservation. Tendencies are in this small country.